It seems that DFRobot have changed their shield and that you will most likely receive one of the new ones if you buy now. The new hardware will only work properly with the original software code if you change the code slightly! Everything you need to set-up a miniE shield (schematics, CAD files, documentation) is included in the project tarBall which you can download on the Download page. If you download the project Tarball from Sourceforge you should receive a copy of the CERN Open Hardware Licence along with the files. If not, see http://www.ohwr.org/projects/cernohl/wiki. I have just installed your miniE sketch and it compiled and installed on the Arduino just as advertised. This may seem insignifigant, but as a total electronics novice, this is a major accomplishment. I have tried several other sketches and have yet to get to this step with them. I am adding the Easystepper board and the dead on timer. The only item I’m missing is the MiniE shield. As a non-electronics person, I am sure that there are many people like me who would love to be able to assemble these components together, load a working system, like your’s and go out and get some work done. If you can’t produce the shield yet, maybe you could give us the information where we could order a copy of the board you have above and a list of components needed. I would buy the assembled shield (and have voted in your poll) if it were offered. You should use the poll as a guide to the popularity of your system. If these components were offered as a complete product, many more photographers who might not be interested in building a system but would love to have a the ability to drive a slider and camera would purchase the product. Put the system you have shown above in a functional box and you have a salable product that is easy to advertise and promote. The only way you can produce your shield is to make it. I think it’s time for a Kickstarter project. The Timelapse+ project raised over $60k. This could probably do that also. Could not agree more, go for it! I’m doing a timetrapper and miniE combo right now, would love to see yours in mass-production aswell. Just as a shield is good enough, even better as a ready-to-use item, just do it cheaper than timetrapper. Following all your steps, love the project! I am very interested in this and would be willing to provide tooling to make an functional custom enclosure and sell at cost to anyone that would want one. Would like to match this to our existing slider system and keep it open source as well. Will be one of the first to purchase from your store when your up and running. I can’t open the files miniE_arduino_shield_v1-3.sch and miniE_arduino_shield_v1-3.brd, can you help me? Are you using the most recent version of Eagle? Problem solved, I had installed the 5.8.0 version, now I have the last, thank you very much for your help, greetings from Spain. As I am planning to control two motors (one for the dolly and one to pan my ballhead) I am curious to know whether there is any way to trigger/control more than one Easydriver? in the current version there is no option for controlling two motors. It would be possible hardware wise though – for example with an Arduino Mega, but the software has no copability yet to do this kind of control. Hey Airic, just received my kit – great project! I’m wondering what would be a fitting stepper motor to carry a Canon 5D mkII camera and would appreciate you’re experience and knowledge in helping e make the right purchase. Thanks – and keep up the great work. it’s always great to hear that people like the project – thanks! In general it is a good idea to add some kind of gearing to improve the forces the motor can create (especially if vertical moves are required). A worm drive would be perfect for this. Also use the full 0.75A the EasyDriver provides. So if you for example use a motor rated with ~3V and 0.75A and then drive it with 12V, you would receive close to the maximum the system can provide. Airic thank you for your reply – I’ll look for “worm drive”, since I know nothing about it. Is it simply a mechanism? Drop me a line if you still have questions! If I recall correct it says 146 146 146 in all fields for date/time. Try it with an UNO, I think it will work then. I will try with an UNO today. First of all, thank you for the incredible work! 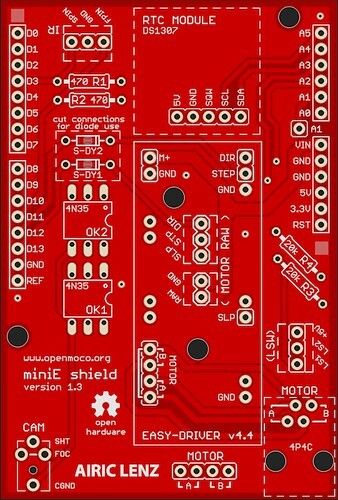 I want to to solve a question before buying the miniE shield. What is the use of LS1 and LS2? Thanks for the quick reply. Yes, I have already downloaded the docu, the extra librarie, compiled the code, etc. And then I have seen these buttons, but I don’t understand what are they for… Sorry if its a dumb question. Hello, the limit switches are supposed to be placed at each end of your dolly-track. When the dolly reaches one end of the track, a limit switch is activated and this causes the engine to stop immediately. I hope this helps understanding their purpose. The limit switches work great – when the motor tries to move the dolly and the switch is triggered it immediately backs up to avoid damages to dolly-mechanism – But when moving to motor home the switches does not stop the dolly. I found that out after disengaging my belt drive and forgot to reset motor home position. I just checked the code and the routine used for the regular motor movement is exactly the same as used for the “motor-home” functionality. So the triggers should work in both cases (same code executed). Has someone else the same problem? I just want to congratulate you for your excellent work. After soldering the components, I programmed the Arduino UNO and everything worked perfectly. Until the moment all is running absolutely Plug and Play. Great job and thank you very much for sharing. Thanks for your great feedback! It’s Nice to know that it works perfectly for you! 1. If the miniE shield were sandwich together with the arduino and lcd keypad shield, the miniE program not working, lcd goes blank. 2. If the miniE shield were removed from sandwich, the miniE program works. can you please open a thread in the forum and post some more details there (e.g. pictures of your shield)? I can not help you from what I know so far. First of all, thanks for sharing this great project. It robbed me so far approx 3-4 hours per night in the last three weeks and I’m still having fun. I needed a faster way to produce PCB’s. Third, my intention is to use MiniE mainly for the Point and Shoot cameras modded by the marvelous CHDK software. Taking into consideration that this can be done via a +5V pulse on the camera USB port i’ve hacked the Shutter port and created an additonal CHDK trigger socked. It should work just fine, power requirements much much lower compared to the available 40mA of the Arduino. Fourth. The motor. This is killin me. Before getting into this Arduino stuff, I allready constructed my time-lapse dolly and it’s based on DC motors that have gears. Your schematic is for stepper only ( 🙁 ) so the only Ideea that came to me was to add a relay hooked on the SLEEP signal and this relay is actually turning my motor on and off. The only problem is how to convert “steps” into “seconds” 🙂 Haha ha…that’s fun. Unfortunatelly, my Frankenstein gives me trouble. I’ve used an RC ESC hooked to a servo tester in order to regulate the DC motor but the ESC…hm…is to smart for this motor switching and randomly starts an internal protection mechanism inside…hm. Fifth. A lot more to talk about but I’ll stop now. I have a focus problem, the arduino is not sending the command to the 4N35 optocoupler. After changing a couple of 4N35`s, I still have the problem. Now i am confused if this is a problem of the program, camera settings or optocoupler. Thanks, and hope to hear soon from you. Is it possible to replace the DFRobot Lcd display shield by this one ? 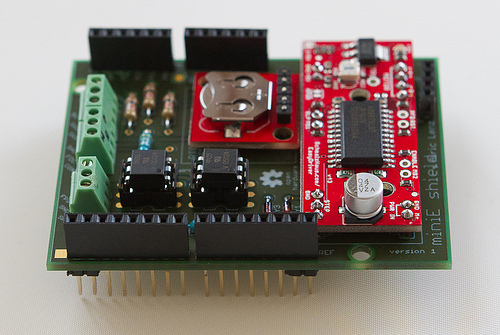 I don’t know the shield from Sparkfun and never tested the system with this shield. If it is pin-compatible you can surely give it a try and report what the result is. I bought the V1 miniengine. Do not get the camera to work, I changed the two 4N35 and still the same. In the scheme of 4N35, the Cathode, pin 2 serves to GND. In miniengine plate, pin 2 not receiving a signal. is there a posibility to trigger the modul extern? I search for a modul with only one stepper motor and with external trigger function. Hello Lukas! The miniEngine v1 has no external trigger functionality while version2 has 2 trigger inputs which can be used for example for starting the shot. 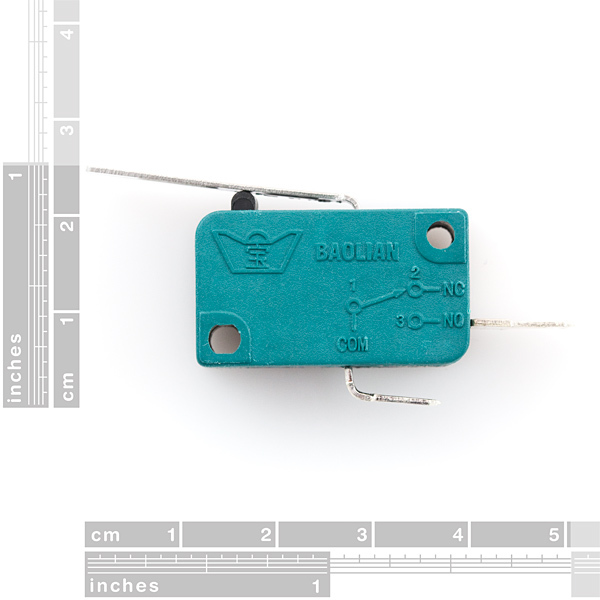 For such a purpose a little Arduino board like the ProMini would be great. oh .. and a DRV8825 stepper driver instead of the EasyDriver would be fine? Do you sell any pre-built models. Did you read the documentation? Everything needed for building the miniE v1.3 is explained in there. For questions there is the forum (not this comment section). This specific “error” was already discussed in the forum – many times. You need to install all needed libraries – otherwise it will not work. I want to buy your system for control my dolly, but i can’t found the best Power supply for the MiniE V1.3.